Youth that are involved in an extracurricular activity such as sports, art or music are more likely to stay in school and develop a positive self-image. The Charity Music Mentoring Program was founded with the understanding that all youth have the potential to succeed in life if they have access to a solid role model that offers support and encouragement along the way. This program is aimed at serving disadvantaged youth in Michigan that are currently enrolled in the Macomb Intermediate School District and have an interest in music. This unique youth mentoring program utilizes music to inspire their students to explore their creative sides, often helping youth to uncover hidden musical talents. 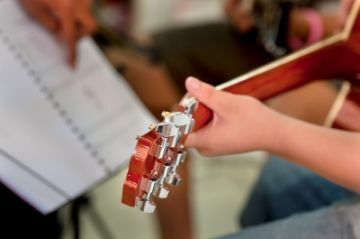 In addition to providing free music education to program participants, the students also have the ability to borrow a variety of instruments to determine which one best suits them. If you have ever expressed an interest in becoming a music mentor, the Charity Music Mentoring Program is currently searching for mentors to serve as music instructors with expertise in the flute, clarinet, drums, voice, and other instruments. To learn more about how you can make a difference with this wonderful program, please contact Music Mentors of Michigan at 586-808-7445. We, too, are passionate about Designing the Next Generation at the Over My Shoulder Foundation. We recently shared the inspirational story about how Amy Kurland, founder of the Bluebird Cafe, served as one of the greatest music mentors as her Nashville cafe launched the careers of several singers and songwriters such as Garth Brooks and Taylor Swift. I, Dawn Carroll, have personally benefited from a music mentor in my life, which ultimately inspired me to found the Over My Shoulder Foundation along with Grammy winner Patti Austin. To learn more about our organization and becoming a music mentor, please contact us!